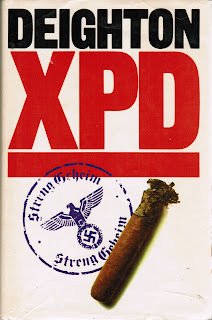 Nazi gold, British, Russian, American spy's and various crooks are the ingredients of this 1981 novel. It's all pretty run of the mill stuff from Mr. Deighton who can be bit "hot and cold" with his spy stories. Set in the 1970's we have several organizations looking for the "Hitler Minutes", documents that could be very embarrassing for Britain especially and tarnish the reputation of Winston Churchill forever. There are the usual double crosses and machinations from the intelligence services that make the task of our hero, Stuart Boyd, next to impossible in solving the job put before him. Unfortunately the story ends very limply. It is as if even the author got a bit bored and wanted to move onto something else. So, not one of Deighton's best, but he has written some wonderful stories as well so don't ever be put off his work.